Combine all ingredients for the salsa in a large, nonreactive bowl and stir until well coated. Cover and refrigerate until ready to serve. Heat a gas or charcoal grill to high (about 400°F) or a grill pan over medium-high heat and rub the grill or grill pan with a towel dipped in oil. 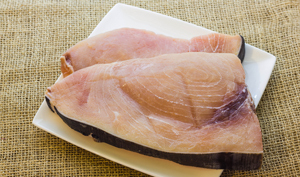 Coat both sides of the swordfish with oil and season all over with salt and freshly ground black pepper. Place fish on the grill and cook, undisturbed, until dark grill marks form, about 5 minutes. Turn and grill until just cooked through and opaque, about 3 to 4 minutes. Transfer fish to individual plates, top each fillet with salsa and serve.